Eugene Bondurant Sledge enlisted in the Marines on 3 December 1942. He was going to a military college to become an officer but in the belief that the war would end before he would get to combat he resigned college and became an enlisted man. When he officially became a Marine he was shipped off to Pavuvu in ship named The President Polk and was assigned to the 1st Marine’s K company as a 60mm mortar man. When he arrived there he would rest there until August and later be sent to a small island named Peleliu and become friends with Corporal Merriell (Snafu) Shelton and Private Jay de l’Eau. It is here when Eugene would engage in combat for the first time and realize the true horrors of war. It was in this battle when the beloved company CO Captain Andrew (Ack Ack) Haldane would be shot and killed. After the tragedy of Peleliu, Eugene and the remainder of the 1st Marines would be sent to their final destination Okinawa. Here he would endure the worst part of the war. He had to endure the horrifying sight of mass murder, human shields, and suicides by the Japanese. Adding to that, he accidentally killed a small family by throwing a grenade in a hut. These experiences made him slightly mad he would see Japanese soldiers in the night and in the morning it would be revealed that it was actually a stack of straws. 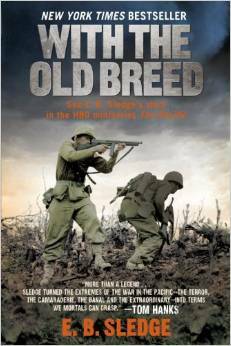 With The Old Breed is overall a well written book but there is one major flaw that I noticed and that is that the book lacked background on the characters. There was an event when a soldier went mad and started to throw pebbles at a dead Japanese soldier’s brain. The book mentions that he was Eugene’s friend but his name was not mentioned. There was another pivotal moment when a Marine named Johnny informs that their company CO was killed but nothing was known about him previously or in the future. Despite these flaws the book had its strengths. Eugine depicted many battles with minute details about the actions taken by him and his fellow Marines. Even when they were resting he provided interesting facts and stories about the effects of the war. I would recommend this book to ninth or tenth graders due to the gore depicted in the photographs and the detail of dying Marines. This book was an incredible book but I think it is the kind of book that you would only read once. I rate this book nine stars out of ten. 1. What was the artillery piece chosen by private Eugene Sledge? 2. What was the name of the ship transporting Private Sledge to the Pacific? 3. Who was the celebrity that went to Pavuvu to cheer up troops? 4. Who was the Marine that was almost shot by Private Sledge? 5. Who was the spearhead of any attack the Marines made? 6. Who came asking for the password in Peleliu? 7. Who was the Marine that was shot because he was mistaken as a Japanese soldier? 8. In what battle did Captain Haldane die? 9. What ship was Pfc.Eugene Sledge transported in? 10. When was H hour supposed to be ? 11. Who was the company gunnery sergeant? 12. Who was the corpsman that got hit in Okinawa? 13. What did the mail come in? 14. Who was the demolitions expert that was mortally wounded in Okinawa? 15. How many casualties did the 1st marines officially suffer?